Here is the tentative Race Day Schedule along with important notes, tips, and advice to help make your day fun and memorable. 1 lap for all age groups in 2018! 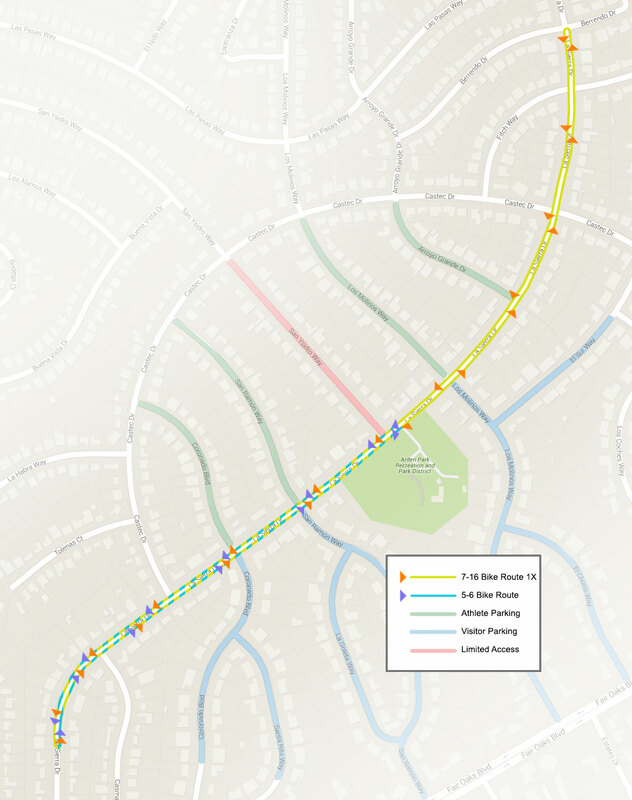 IMPORTANT: There will be no parking on the bike course (La Sierra Dr., from Berrendo Dr. to Casmalia Way) and the Arden Park parking lot will be closed. We will have a designated spectator bike parking area next to the pool. Car parking will be available along all the cross streets of La Sierra Dr., but you will not be able to cross La Sierra Dr. during the event. Please plan your parking accordingly. La Sierra Dr. will also be closed to foot traffic and riding of bikes expect for participants during their wave and event volunteers. The safety of all participants is our number one priority. You should have already gone to the packet pickup and received your athlete packet which included your race bib numbers (the larger one to be place on the handlebars on the front of the bike and the smaller one to be placed on the front of a t-shirt or on a race belt). You must bring these numbers with you to the race. Have this number handy when you check in and get body marked. 6:45 a.m. – Athlete Check-in and Body Marking opens. Registration and Body Marking has moved this year, it will be located near the Rec. room on the grass. Bring your bib number here and volunteers will check you in, write your body markings, and answer any questions about bib placement. You must bring your bib number to the body marking station. IMPORTANT: All participants must check in before 7:30 a.m. in order to be entered into the computer to have split and finish times. It is each participant’s responsibility to check-in before the start of the event. We cannot add participants once we start the timing program. Also, it is important to have a volunteer complete the participant’s body marking. We have a set format that helps the volunteers complete timing with minimal errors. Transition Area – The transition area will be staffed with experienced volunteers who can assist you in setting up. This area will be divided into different sections based on age groups. What to bring: Bike, helmet, running shoes, socks, towel, extra clothing and a water bottle. One parent is allowed in transition area to assist in setup, but we encourage letting the athletes be responsible for their own setup. This event is designed as a fun, learning experience. Once the transition area closes (approximately 7:40 a.m.) only volunteers and athletes will be allowed in. IMPORTANT: Absolutely no riding inside the transition area. 7:40 a.m. – Transition area closes. 7:45 a.m. – Pre-event announcements will be made at the finish area. 8:00 a.m. – First swimmer in the water (boys ages 5-6). Athletes start times and wave numbers will be posted on the backside of the bathroom building by 7:15 a.m. View our Estimated Start Times page for details. Please note that start times, duration between waves, and the order of age groups are varied; please verify your start time the morning of the event. No athletes will be allowed on the bike course without a helmet. Absolutely NO exceptions! The chin strap must also be fastened. Volunteers will be in the transition area to check helmets, fasten when necessary, at the “Bike Out” exit (the driveway heading into and out of the park). Run Lap Completion/Balloons: There will be balloons on the run course. These balloons will be placed where volunteers will be tallying laps and handing out silicone wrist bands for each lap completed on the run course. Participants will be handed a wrist band after each lap completed. They can place the band around their wrist, or simply hold onto them (please make sure your son or daughter does not wear their own silicone wristbands to the race, this leads to confusion during the run portion). After obtaining the correct number of bands (completing the required distance based on their age) volunteers will direct the participant to veer to the right and head to the Finish Line. The bike course for the 5/6 and P/C age groups, is a 1 mile counterclockwise loop (out and back) heading .5 miles west (toward Casmalia Way, turning LEFT out of the park) along La Sierra from the park entrance, and then back east making a RIGHT turn into the park. 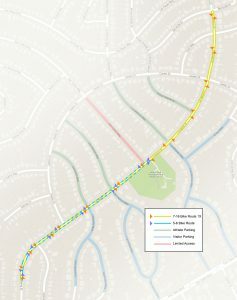 The 7-16 age groups will complete one full lap of a two mile loop heading one mile in both directions of the park (right out of the park, u-turn at Berrendo Drive, down to Casmalia Way, another u-turn and back to the park). The counterclockwise course will have volunteers at the two turnarounds to obtain split times and to record laps. The run course is a 1/4 mile loop. Your age division determines the distance of swimming, biking, and running. Please see the Distances page to determine your distances. Water station: Water will be available on run course. Race Etiquette: For the safety of all athletes, please talk to your child about riding the bike to the right and in a straight line. When passing a rider, call out “On Your Left” as you pass to the left. Finish: The children will receive a finisher’s medal after crossing the finish line. There will be water, fruit, and treats as well. There will be an award ceremony that will follow immediately including the raffle, so be sure to stick around after the race. Please make use of the podium/photo backdrop to record your child’s accomplishment. Also, if you have any photos that you’d like us to put on our website photo album please email them to ardenparktriathlon@gmail.com. Raffle: We have a great raffle scheduled after the race and before the awards presentation, courtesy of our sponsors. Please stay around after the race; we have many great raffle prizes to give out to athletes. All athletes are automatically entered, and must be present to win. The details of racing a triathlon can seem overwhelming. Please rest assured that there will be several experienced Triathletes stationed in the transition area to help you set up, and answer any questions that you might have. Our goal is to educate and inspire these athletes to accomplish something great with little assistance as possible. Thanks for your support, your cheers, and encouragement of all athletes.